Most of my readers are probably already aware that Republic announced and then scrapped a serial to be based on Jules Verne’s Twenty Thousand Leagues Under the Sea, but I thought it would be interesting to view, above, some actual evidence of the abandoned chapterplay (its place on the schedule was taken by Haunted Harbor). I have to wonder how Republic would have adapted the Verne book, which has no clear-cut villain and no clear-cut hero either, to the serial format; I suspect that they wouldn’t have used much of the story, aside from the title and some character names. Nemo would probably have been turned into a supervillain out to rule the world, and Ned Land into a two-fisted US Navy investigator out to bring him down; Professor Aronnax would have become a scientist with a MacGuffin coveted by Nemo, and would have been given a daughter to fill the heroine slot. While Republic’s Leagues would undoubtedly have had little in common with Verne, it would doubtlessly have been more fun to watch than Columbia’s later foray into the world of Verne, Mysterious Island. It also would have been interesting to see what the Lydecker brothers would have done with the Nautilus. 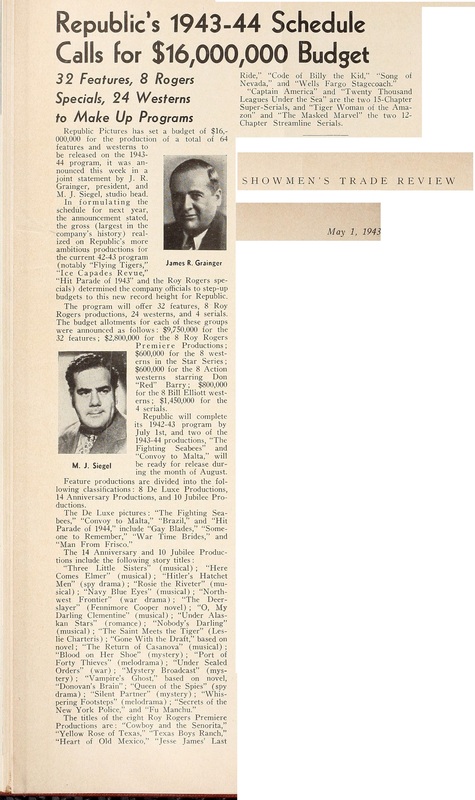 Below is another exhibitor article that talks in greater detail about Republic’s entire production slate for 1943-1944; if you click to enlarge it, you’ll see another mention of Leagues at the end. Note in both items that the title of Tiger Woman is given as Tiger Woman of the Amazon, which seems to definitely establish that serial’s geographical locale–a matter of some dispute among buffs–as South America. This entry was tagged Republic serials, Serial scrapbook, Serials that Never Were. Bookmark the permalink. The mention of CAPTAIN AMERICA almost a year before production proves the theory by one serial fan that it was originally planned as a Mr. Scarlet serial is not true.